This groundbreaking new writing series combines time-tested classical techniques–the imitation and analysis of great writers–with original composition exercises in history, science, biography, and literature. It is designed as the perfect next step for students who have completed the Writing With Ease series or an equivalent composition curriculum. I have a 5th grader who has not yet done the Writing with Ease. He has done 4 year of FLL and some other writing programs. Where should I start? You should use the diagnostic tests (http://downloads.peacehillpress.com/pdfs/samples/wwe/wweevaluations.pdf) to find out where he would be in Writing With Ease. If he can pass the level 3 test, then he should use the chart at the end of this article (http://downloads.peacehillpress.com/samples/pdf/WWEandWWSexplanation.pdf) to determine which route to follow. I have a 13 yo boy, grade 7. Just purchased WW S 1 and WTM Grammar programs. How do we / do we incorporate additional literature reading into our studies? He loves to read. Do I simply allow free reading of good books, or should I require additional writing assignments? Many thanks! No need to do additional writing/reading assignments…he’ll get plenty of that in WWS 1. He should read lots of good books, in the subjects or genres that he enjoys. Is buying the textbook necessary? Can I use the workbook alone? 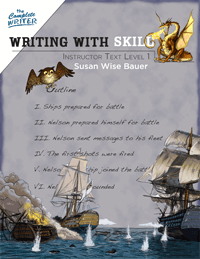 For the Writing With Skill series, it is necessary to have both the Student book and the Instructor book. I can not get the sample links to work for any of the levels or various materials. Is it possible to see samples? The posted response on May 15, 2018 shares new links for WWS Instructor and Student material. These links appear to have the complete downloadable PDFs. Was that your intent? Thanks for checking! But actually those are just the samples. The samples are large because the book is VERY large. That sample is less than a third of the book. I have a 7th grader and an 8th grader. We have never used Writing with ease, but I am looking for a new writing and grammer program. Where should I start them at with a writing and grammar program. We are currently using Writing Strands intermediate level 1 (from masterbooks) for both of my girls. I really need to find something that will help prepare them for highschool and even college. Their writing and grammar skills are not where I feel they need to be at the moment. I am looking for a writing programe for my 14 year old who battles with English skills, he is a slow reader, and has not done any writing programmes or skills development, other than the basics at a local school. He is now homeschooled and needs a program that will prepare him for his GED exams in a few years. Where would I begin? We would suggest beginning with Writing With Ease, Level 3.